For the first time in Malaysian history, the opposition got more votes than the ruling coalition in the 2013 elections. This clearly indicates that the regime is challenged by increasingly competitive elections. Within political science, such regimes are often categorised as electoral authoritarian (Schedler 2013). They are stable as long as the ruling party or coalition is capable of controlling the electoral process. But they are inherently unstable because voting offers opposition movements opportunities to effectively challenge regime elites. Presumably, Malaysia is undergoing a protracted transition from electoral authoritarianism towards democracy. Opposition groups strive for “political liberalisation, step by step, strategic interaction by strategic interaction, over the course of years and decades” (Eisenstadt 2000: 6). This process has accelerated since the late 1990s. The main strategic interactions in the Malaysian case are elections and negotiations over electoral reform. In this vein, the 2013 general elections may be seen as a step in this direction. It is possible, maybe even probable, that the ruling coalition in Malaysia would lose in fully free and fair elections. But the governing parties need elections to legitimate their rule. They control the terms of competition, while opposition parties control the terms of electoral legitimacy. This authoritarianism has its inbuilt weaknesses. Voters are not predictable and polls may get out of hand. The strategic dilemma for the incumbents is that the more they control elections, the more they lose credibility. For their adversaries, there is a dilemma between accepting the rules of the game and criticising them or even denying them any meaning. Schedler (2002) describes elections in electoral authoritarian systems as multi-layered nested games, that is, two-level games where the “game of electoral competition and the meta-game of electoral reform unfold in a simultaneous as well as interactive fashion.” Opposition parties see polls as a means to set the rules of the game on the agenda and to unmask the manipulations of the ruling coalition. This is why the NGO alliance Bersih (the Coalition for Clean and Fair Elections) and the opposition parties have focused their demands on electoral reform. 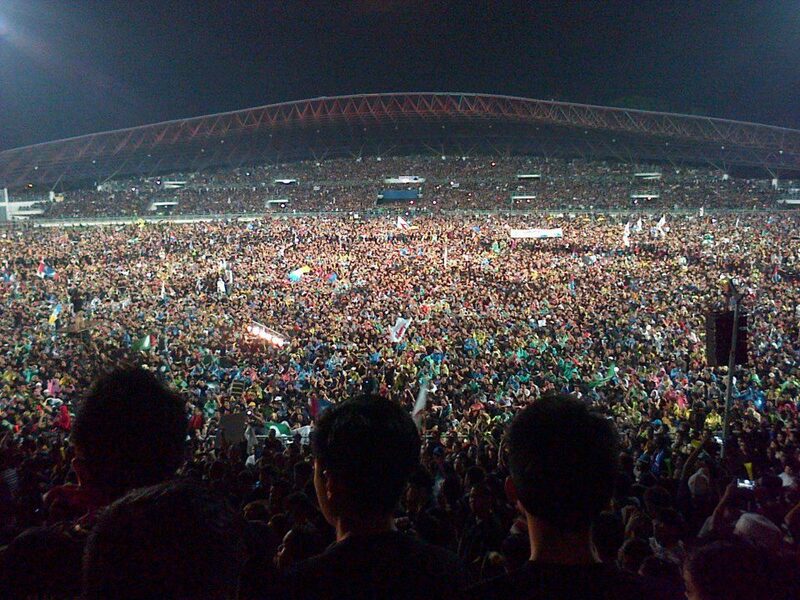 In 2007, a Bersih rally attracted up to 50,000 people and stimulated opposition support for the 2008 elections. The Bersih 2.0 demonstration in July 2011 called for a clean-up of the electoral roll, an improved postal ballot system, the use of indelible ink, longer campaign periods, free and fair access to mass media for all parties, the strengthening of public institutions, and an end to corruption and dirty politics. This pressure led to the setting up of the Parliamentary Select Committee (PSC) on Electoral Reform in October 2011. The PSC tabled its report in April 2012, and the Election Commission agreed to implement 7 of the 10 proposals. Yet, according to Bersih 2.0, the PSC report did not adequately address key issues. A “minority report” of opposition members of the PSC was not accepted by the Speaker of Parliament. The botched reforms brought about a new movement. In April 2012, the Bersih 3.0 rally in Kuala Lumpur, this time backed by more than 80 NGOs, reiterated most of the previous demands, attracting up to 300,000 protesters according to the organisers’ estimates. Although the establishment of the PSC and the introduction of some reforms may be seen as a success, the conduct of the 2013 elections made clear that major flaws still persist in connection to the delineation of constituencies (i.e. gerrymandering and malapportionment), the length of the campaign period, the large number of unexplained new voters in some constituencies, and the use of indelible ink that in reality can be washed off quite easily. There are also strong indications that the BN greatly benefits from faulty electoral rolls, which are often incomplete and tampered with through multiple registrations and the registration of non-residents, amongst other things. Any potential transition to democracy in Malaysia will most probably occur primarily in the electoral arena. The main question is how the ruling coalition and Pakatan Rakyat come to terms during the next redelineation exercise and whether they can agree on elections that are fairer than in the past. May be the regime unravels in a very short time by means of defections, especially in East Malaysia; or the ruling coalition starts to cooperate with opposition parties. Najib once announced plans to loosen the tight grip of authoritarianism, to tone down the pro-bumiputera policies and to further national unity and amity amongst ethnic and religious groups. Upon closer inspection, all of these reforms were revealed to be nothing more than a facade designed to appease both the indigenous opposition and international observers. The prime minister depicted himself as a reformer by way of his “1Malaysia” campaign – though realpolitik still prevailed. In front of the UN General Assembly, he called for a “global movement of the moderates” from all faiths to fight extremists. Yet, until today, tensions among religious groups are simmering as epitomised by the dispute about using the word “Allah” in the Malay language. Najib also started to at least tone down affirmative action measures in favour of the bumiputera. But these reform programmes were essentially buried in September 2013 when the prime minister, ahead of the UMNO party elections, announced measures offering more business and training opportunities and affordable housing to the bumiputera under the Bumiputera Economic Empowerment Plan (BEEP). Obviously, ultra-nationalistic and Islamist pressures, especially those from outside the party system, have not subsided. Right-wing groups such as Pertubuhan Pribumi Perkasa (Indigenous Empowerment Organisation; Perkasa) are fighting for the perpetuation of the concept of Malay supremacy (Ketuanan Melayu). In any case, recent PAS elections in November 2013 evinced a consolidation of the so-called Erdogan faction of professionals, which has buttressed their pragmatic approach against ulama orthodoxy and the conservatism abhorred by religious minorities in particular. This has also confirmed the trend of a stabilisation of a party system characterised by two major coalitions. Since 1999, the opposition has slowly – although with some setbacks – gained in strength. The Pakatan Presidential Council meets regularly, tensions between DAP and PAS have been reduced, and cooperation during elections between coalition members is improving. Moreover, the coalition is now better represented in East Malaysia where they have taken over the role of indigenous opposition parties. Pakatan Rakyat is now socially relatively well rooted and maintains close connections to a growing civil society movement. Whereas the ruling coalition has strengthened its presence on the Internet, traditional media are opening up to a certain extent. Lindberg (2006) maintains that through elections “political actors as well as large portions of the populations learn to replace fear and mistrust with a growing but somewhat cautious acceptance and coexistence…over a longer period the incentive structures of electoral institutions tend to pull elites together rather than divide or disperse them.” So far, this latter statement is difficult to sustain with reference to Malaysia. There seems to be an awkward situation where the two coalitions are fighting each other and where polarisation is growing, although the overall political process would demand rapprochement. Both sides should have an interest in accommodation and in reaching a consensus on the form of transition. Erdogan “faction” ? You mean those among PAS or UMNO, who are Islamic bigots, racists, and anti-Semites ? Oh, you mean Mahathir. Instead of quoting academic theorists, just observe Perkasa et al, and the demonisation of Kassim Ahmad, and you will know where Malaysia is heading. There is no transition to democracy in Malaysia; there is a transition to Islamic autocracy, and that is where Erdogan become relevant. Seems Malaysian democracy will remain a fiction as long as the country continues to follow the singaporean model of rule by control of the law courts to remove any effective opposition. Anyone there understand the doctrine of separation of powers? Couple this with rigging of electorates, religious sectarianism, ethnic disharmony and any meaningful democratic movement is still a long way away. an unemployment rate of about 4 % or less. There would be competent, even if autocratic, leadership capable of micromanaging the country. There would be no Islamic radicalism and calls for Malay supremacy. There would be no outlawing of the use of ‘Allah’ by non-Malay Christians. There were would be intelligent judges on the High Court who speak perfect English, even if they are all Government appointed and not entirely independent. There would be clean streets, gutters, trains running on time, people who work 8 am-6 pm, and there would be affordable health care and a reasonable safety net. and, finally, a Prime Minister who works 14 hour days. Other than autocracy, poor treatment of guest workers at times, and a somewhat ineffectual group of opposition parties (or in Singapore, one ineffectual but sincere opposition party), there is little that Singapore and Malaysia have in common, including the fact that Singapore is about 78 % Singaporean-Chinese and Malaysia is about 23 % Malaysian-Chinese. UMNO/BN is both autocratic and incompetent; I would argue that the PAP is merely autocratic, as even many of its detractors will acknowledge that the PAP is quite competent, if quite autocratic as well. This is silly. A large proportion of the Malaysian population is employed in agriculture, though with increasing numbers in manufacturing. Singapore is a trading post, with a few people turning out Soundblaster cards. Your comments are silly, and the very fact that Singapore has no agriculture defeats your very argument, which is with yourself. A large proportion of Malaysians are also in the service industry, That has nothing to do with the fact that Malaysia has more opposition parties than Singapore, which is a fact, and that as weak as the Malaysian opposition parties are, they still control several states in Malaysia, where once UMNO/BN controlled all but two, and even earlier, all of Malaysia. How many opposition Parliamentarians in Singapore, then ? Six, I believe, and they have no power and little money and do not get 50 % of the vote in Singapore (yet), though the Worker’s Party and the Democratic Party of Singapore does have some loyal support, but suppressed by the PAP. Agriculture in Malaysia only proves that vast differences between Singapore and Malaysia, my own argument at the outset, and in fact, UMNO and PAS get most rural support, and DAP and PKR get more urban support. Oh, is Singapore a trading post ? You are making my argument, which is that both nations have little in common but autocracy and some commercial industries, far more successful in Singapore than Malaysia, so you are arguing with yourself. Malaysian Airlines (MAS) has been in debt for at least 30 years, Singapore Airlines (SAS) has had a surplus for at least 30 years. That epitomises the difference between Malaysia and Singapore. You will forgive me, but as I WAS BORN AND RAISED IN MALAYA/SINGAPORE and spent close to 40 years there, from before independence to after Malaysia’s and Singapore’s independence, I think I know a little about both Malaysia and Singapore, Sir. Thank you for the lecture, as if I didn’t know that Singapore was a city state, primarily engaged in commerce, service industries, education, and biotechnology (more recently). Mandarin and Bahasa Melayu ? I thought not. Traders (middle-men) are the richest people in the world, and peasant farmers are the poorest. The assertion that you can give one the income of the other, just by swapping political leadership, even if that were possible, is one of the silliest things I’ve ever read. Better check that statistics again! mr Cohen, perhaps it was remiss of me not to mention the legal persecution of mr. Anwar in my reference to the singaporean legal model. I wonder why you made no reference to this in your otherwise very erudite remarks? Andreas Ufen is a distinguished political scientists and very familiar with Southeast Asia. In a less scholarly and more practical perspective, though, optimistic perspectives like “elections are breeding democracy” might be correct, but probably have a very long time perspective in this part of the world. Some long lasting parties and ruling coalitions have lost the confidence of large parts of the electorate but can’t be toppled. As much as democratic activists are craving an “end to corruption and dirty politics”, the survival instinct of the powers that be seem to be stronger. Cambodia and Malaysia show that for entrenched parties like CPP and BN there is too much to lose if they would accept an electoral defeat. Tens of thousands of cronies and the billions at stake won’t be given up so easily in free and fair elections. For change through elections all players must be prepared to lose. Sadly enough, this is not yet the only game in town in Southeast Asia.